Experience a wildlife safari with a unique difference in world-renowned Kruger National Park! Rhino Post Safari Lodge, Rhino Walking Safaris and our Sleep Outs are the perfect trio of driving safaris, walking trails and slumbering under the stars! We are situated in a private concession near Skukuza, accessible by road via Paul Kruger Gate or Skukuza Airport is a 30 minute road transfer away. Start at Rhino Post Safari Lodge, enjoying early morning and evening driving safaris on our 12,000 hectare concession and an additional 170km of national park roads that we explore ‘after-hours’ when the self-drive tourists have left! Our unfenced Lodge situated by the seasonal Mutlumuvi River also overlooks a waterhole, visited by a myriad of wildlife. 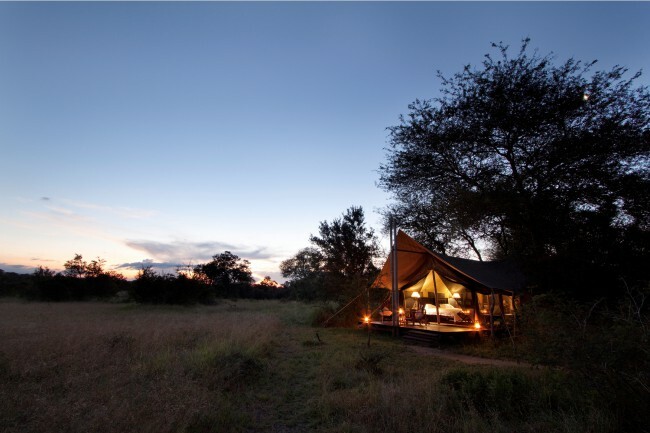 Our 8 spacious, luxury tented suites blend with the surroundings and guests enjoy bush views from the bedroom, freestanding bath, outdoor shower, and private viewing deck. Then, on to Plains Camp for a walking safari to remember! Overlooking Timbitene plain and waterhole, our trails camp accommodates 8 guests in 4 luxury ensuite tents. Polished brass, silverware, leather and antique décor gracefully complements the tranquil bush ambiance. Explore the wilderness on foot under the expert guidance of two experienced, armed trails rangers. Our leisurely 3-4 hour foot safaris focus on the smaller things and learning about plants, spoor, tracking and the sounds and scents of the African bush! Our Sleep Outs offer the ultimate bush experience, so book your spot on a magical night under the stars! Enjoy sundowners and a sizzling braai on the communal deck overlooking a waterhole before snuggling up in sleeping bags under insect-proof gauze tents on 4m high platforms connected by ladders to the communal deck and bathrooms. Doze off to the nocturnal symphony of the African bush! Contact us today for an unsurpassed safari experience in the Kruger National Park!